Alligatoridae is a family of large, semi-aquatic reptiles in the order Crocodilia, variously known by the common names of alligator and caiman, and characterized by a lizard-like appearance, armor-like skin, long tapering jaws, and the fourth enlarged tooth of the under jaw received into an internal pit formed for it within the upper jaw. This is in contrast to the similar large reptiles in the family Crocodylidae (crocodiles), which have the fourth enlarged tooth of the lower jaw received into an external notch. There are many extinct genera and species, but only about eight extant species, two of which are known as alligators and six of which are known as caimans. Members of alligatoridae provide a valued ecological function in food chains. They consume invertebrates, such as snails and crustaceans, and vertebrates, such as fish, mammals such as capybara, birds, and turtles, and in turn the young alligators are prey to a large number of animals, such as birds of prey, wading birds, cats, otters, large fish, and turtles. However, alligators and caimans exhibit substantial parental behavior in guarding their nests and protecting their young. The main predator of members of this family are human beings, which have harvested vast numbers for such purposes as shoes, belts, bags, and other products. In the Pantanal alone, an estimated one million skins are year were illegally poached in the 1970s and 1980s. 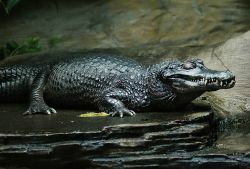 Some species, notably the Chinese alligator (Alligator sinensis) and broad-snouted caiman (Caiman latirostris), are at risk due to hunting and habitat destruction. Alligators and caimans have long fascinated human beings with their unique forms and behaviors and their impressive size. They also pose less danger to human beings than some of the species of crocodiles. Crocodilia, the order to which alligators and caimans belong, has a long history, appearing in the fossil record about 84 million years ago in the late Cretaceous period. Today, the extant species are placed into three families: Alligatoridae (alligators and caimans), Crocodylidae (crocodiles), and Gavialidae (gharials). All of these are characterized by a similar lizard-like form, large size, skin that is thick and armor-like, a long snout, tecondont dentition (teeth set in bony sockets like mammals), teeth replacement throughout their life (except very old age), and a flexible semi-erect (semi-sprawled) posture. Each can walk in low, sprawled "belly walk," or hold their legs more directly underneath them to perform the "high walk" (Britton 2001). The semi-erect posture makes it possible for some species to gallop on land if necessary (Britton 2001). Alligatoridae includes two extant groups, the alligators and the caimans. One of the differences between members of Alligatoridae and the similar members of Crocodylidae, the crocodiles, is in the fact that typically the upper jaw completely overlaps the narrower lower jaw, with the teeth of the lower jaw fitting into depressions in the upper jaw, and thus mostly hidden when the mouth is closed. In crocodiles, the teeth of the lower jaw fit along the mouth of the about equally wide upper jaw, with the upper teeth interlocking with the lower teeth when the mouth is closed and more visible. In particular, the difference may be evident with respect to the enlarged fourth tooth of the lower jaw. In members of Alligatoridae, it generally is not visible, fitting into a pit within the upper jaw. In crocodiles, it fits into an external notch and is visible. However, this typical difference with respect to teeth is not always consistent and thus is not a defining characteristic. Another major difference that distinguishes extant alligators and caimans (family Alligatoridae) from crocodiles (family Crocodylidae) and from gharials (family Gavialidae) is in their tolerance of salinity. Crocodiles and gharials have functioning salt glands (modified salivary glands) that allow them to excrete excessive salt and thus be more tolerant of saline environments. Alligators and caimans have the same structures but they are non-functioning terms of salt excretion and thus have a lower tolerance to salinity. Alligators also differ from crocodiles in having wider and shorter heads, with more obtuse snouts, lacking a jagged fringe (which appears on the hind legs and feet of the crocodile), and having the toes of the hind feet webbed not more than half way to the tips. They also differ perceptible from the two surviving species of gharial (Gavialis gangeticus and Tomistoma schlegelii) in that the gavialids have a much thinner snout. The "true alligators" belong to the genus Alligator are now restricted to two species—Alligator mississippiensis in the southern United States and the small Alligator sinensis in the Yangtze River, People's Republic of China. These are the only two countries with wild populations of alligators, and the United States is the only nation where both alligators and crocodiles live side by side. 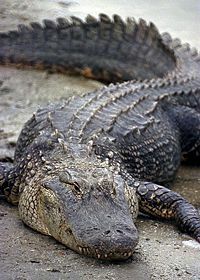 While the alligator is widely distributed in the southern United States, from Texas and Oklahoma to Florida and north to the Carolinas, the majority inhabit Florida and Louisiana. The American alligator (A. mississippiensis) grows to 4.24 meters (14 ft) and a weight of 1000 pounds (454.5 kilograms) (Roth 2006), with the record length of 5.81 meters (19 feet 2 inches). The Chinese alligator (Alligator sinensis) is endangered and lives only in the Yangtze River valley. It is much smaller, growing only to an average of 1.5 meters (5 feet). The name alligator derives from the Spanish el lagarto, which means "the lizard." In Central and South America, the alligator family is represented by five species of caiman, which differ from the alligator by the absence of a bony septum between the nostrils, and the ventral armor is composed of overlapping bony scutes, each of which is formed of two parts united by a suture. Caimans tend to be more agile and crocodile-like in their movements, and have longer, sharper teeth than alligators (Guggisberg 1972). Some authorities place all five caiman species into the genus Caiman, while others divide them into three genera, splitting off the two species of smooth-fronted caimans into a genus Paleosuchus and the black caiman into Melanosuchus. The spectacled caiman, Caiman crocodilus, has the widest distribution, from southern Mexico to the northern half of Argentina, and grows to a modest size of about 2.2 meters. 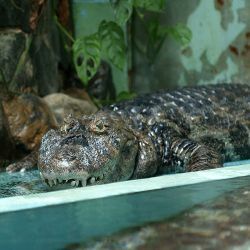 The largest caiman in size is the near-threatened black caiman, Melanosuchus niger, of the Amazon, also known as the jacare-assu or large caiman. Black caimans grow to 5 meters (16.5 feet) (Britton 2006), with the largest recorded size 5.79 meters (19 feet). The smallest caiman is Cuvier's dwarf caiman or the musky caiman, Paleosuchus palpebrosus, which reaches 1.5 meters (5 feet) in length (Britton 2002). It is found in northern South America, in Bolivia, Brazil, Colombia, Ecuador, French Guiana, Guyana, Paraguay, Peru, Surinam, and Venezuela. The smooth-fronted caiman (Paleosuchus trigonatus), also known as Schneider's smooth-fronted caiman, is the second smallest member of the Alligatoridae family, and is found in the Amazon Basin of Bolivia, Brazil, Colombia, Ecuador, French Guiana, Guyana, Peru, Suriname, and Venezuela. The yacare caiman, Caiman yacare, or just jacaré (in Portuguese), is found in central South America, including northern Argentina, eastern Bolivia, south-west Brazil (especially in the Pantanal marshland), and the rivers of Paraguay. The broad-snouted caiman, Caiman latirostris, is found in eastern and central South America, including southeastern Brazil, northern Argentina, Uruguay, Paraguay, and Bolivia, particularly in freshwater marshes, swamps, and mangroves. Its notable physical characteristic is its broad snout from which its name is derived. The species is threatened due to illegal hunting and loss of habitat. Caiman's mating cycles, previously thought to be spontaneous or year-round, appear to be linked to the rainfall cycles and the river levels in order to increase their offspring's chances of survival. An alligator nest at Everglades National Park, Florida, United States. Britton, A. 2001. Locomotion: General. Crocodilian Biology Database. Retrieved January 10, 2008. Britton, A. 2002. Paleosuchus palpebrosus (Cuvier, 1807). Crocodilian Biology Database. Retrieved January 10, 2008. Britton, A. 2006. Frequently asked questions: Which is the largest species of crocodile?. Crocodilian Biology Database. Retrieved January 10, 2008. Guggisberg, C. A. W. 1972. Crocodiles: Their Natural History, Folklore, and Conservation. Newton Abbot, David & Charles. ISBN 0715352725. Roth, J. 2006. American alligator. eParks.com. Retrieved January 10, 2009.